Wayne Lynch is a legendary surfer/shaper from Australia. A key figure in the Shortboard Revolution, an era in the late 60s and early 70s when board lengths went from 10 feet down to 7 feet literally overnight. Regarded as a child prodigy, Lynch was winning contests both early and into his late teens. He developed a unique style of surfing that linked radical, yet smooth turns into one continuous curve on a wave. Lynch entered contests but eventually grew to disdain them, instead choosing to surf at isolated breaks, away from all of the media attention. 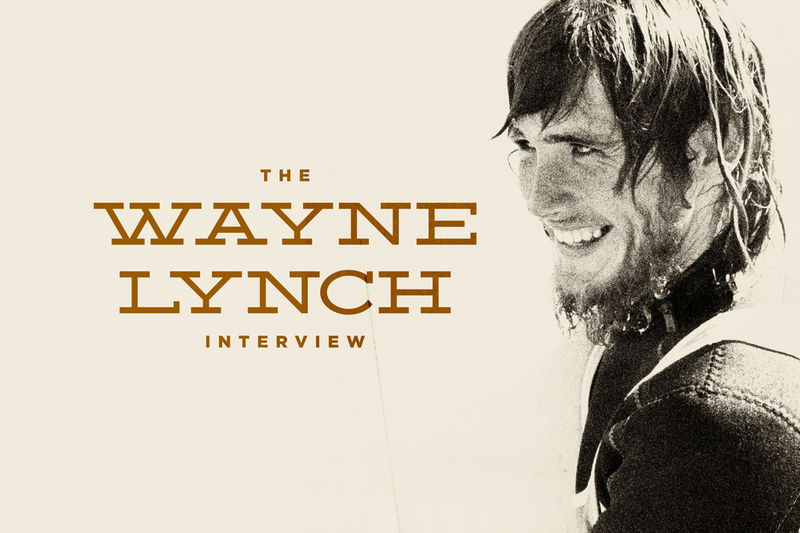 A recent film captured his life in Uncharted Waters: The Personal History of Wayne Lynch. What was the origin of Uncharted Waters? It’s been an ongoing thing for about 6 or 7 years – and the question would always be, “Would you do a film or be a part of a film? Perhaps it was that I have lived a life of surfing that is unique – maybe more so than most? A life not following a circuit, being part of an industry or an administrative position – I have done none of that. I think I’ve had a lot of experiences in my life that perhaps a lot of people haven’t. Sometimes I think a part of my life has been like a comedy drama (laughs). How did it feel to be a part of this film? It’s hard to describe. Firstly, I am not comfortable with celebrity and all that sort of thing. I never have been and that is why I have led such a reclusive life. I have a really good life – a life I really love. But if there is something about my life that is worthwhile and that people are interested in it and if there was something that was said or done that can actually touch their lives, and perhaps inspire and have them think about their lives and their surfing in a particularly positive way – then I think it would have been worthwhile. In the end, that is why I eventually relented to having a film about my life. It’s a film about me – not through my eyes. I know that I made a contribution to surfing. What that is – is up to other people to define and for them to acknowledge or not. What were you hoping the film would accomplish? That the film could have people thinking about their own lives and not just about surfing, Something that could get them to think about the big picture. That we can live and get by by being true to ourselves. This is basically how I lived my life – with some hardships and some compromises along the way. I think it is really important for young kids to know that. And the fact that I’ve survived proves that perhaps it is possible (laughs). If there is one person I’ve inspired, then I think it was all worthwhile. How do you respond to those descriptions that you’ve dropped to Earth from another planet or that they call you Surfing’s Messiah? Those are just words people use. Tongue-in-cheek partially. I guess it is just a way to describe something they couldn’t describe any other way. Even so, it doesn’t really mean anything. It just puts a smile on my face. I’m sure their intention is really positive and meant well so I’m not concerned by it. Back in those years when I was between 16, 17 and 18, the attention came on me so strong and in such a huge capacity, it became a burden. It was really hard for me to deal with. I mean, I was barely 16. I was so young and I was barely trying to find my way in life or who I was. At that age, there are so many aspects of just growing up into adulthood and to have so much attention on me back then was a very difficult experience. It was okay for a while, but it began to be too much. I needed to just get away and work out who I was and get on with the business of growing up. But the actual statements, they certainly do not bother me. In the film, there is so much that embarrases me because there is so much attention given to me. It’s a film about me – not through my eyes. I know that I made a contribution to surfing. What that is – is up to other people to define and for them to acknowledge or not. But I think I’ve always had a good grasp on the big picture of life. And in the big picture of life – it doesn’t mean anything. There is a scene in the Paul Witzig’s film Evolution where you throw your board into the surf and you start cursing at it. Tell us about that moment. Back then everything was just so experimental. The fin had broken out of it and I had changed the fin out. The fin I had put in, a beautifully foiled one, was my first contact with Ted Spencer. Ted had spent time with George Greenough and you might know, fin foils were a big and important issue in George’s life. What I didn’t realize was that the fin was smaller than the original. So even though the board went well, it didn’t have the same dynamic as it had before. So what you see in the film was an accumulation of a month’s worth of frustration with it. People love that scene, but I do get a bit embarrassed by it. It was pretty funny (laughs). There was nothing I could do but yell and spit at it! You were only 16 at the time, yet you had a pretty sophisticated or detailed approach to how you wanted to surf and what your equipment should do. I had been shaping my own boards since the age of 14. I always took a great interest in the boards I’ve owned from other people like McTavish’s Plastic Machine. I feel that particular board was truly the beginning of my interest in shaping. That was the board that really inspired me to get involved, because at that time it was the best board I had. It was thinner, lighter, shorter, and it had a slight vee in the bottom. I have always been fascinated by design; boats and airplanes and foils and shapes and curves. It is just something inherent in my makeup, I suppose. In the film you mentioned that some of the surfing maneuvers you wanted to do came in a dream. Can you tell us a bit more about that? Just before I would go to sleep at night, I would sometimes get these visions of people surfing. It wasn’t a particular person. But there was one profound vision as I was on the floor listening to music. It was ironically, a natural-footed surfer riding some beautiful little rights at a river mouth with a creek that had sand embankments. I walked around the curve and there was this person surfing and I was just watching. The way he was surfing was just phenomenal. Just these beautiful and flowing lines. And no matter what maneuver, it was taking place in one movement and not in separate acts. It was a series of floaters, 360s, and re-entries and that sort of thing. I had such a vivid picture of that, it stuck with me my whole life. And as boards got better and my technique developed, the boards needed to get shorter and I needed to technically get better. When those things got together, suddenly things started happening. I didn’t expect it and it was quite spontaneous. And eventually my surfing began to take on nuances of those dreams. I pursued that dedication all through my surfing life. The real big reason I didn’t pursue competition with any real intent was I was pursuing the potential I felt the whole time I was surfing – and what was possible. I was consumed with it and I completely absorbed myself into that quest. But I never really got there, I’m afraid. There was so much to learn about surfing and surfboards – so many aspects we didn’t understand. But I knew what was possible. I had done a few 360 turns and barrel rolls so I knew you could incorporate it into your surfing if you could develop your technique. When I watch the guys surfing today, Kelly and – I’ll leave someone out if I start naming names and I don’t want to do that. But whether it be Kelly, Fanning, or Dane Reynolds or whomever – I see in them what I was trying to do. I am fascinated to watch how they surf now. They’ve taken what went before and worked with it with great dedication, discipline, and hard work. And they’ve got it to a place that I’ve always knew it could go. So I’m very respectful of what has been achieved. In the Q+A after the film, you mentioned that you admired Aboriginal dance and that their source of energy is located in their center. Can you tell us more? What I saw with Aboriginal dance were people who were so completely grounded and centered in their stomach or abdominal area. Because they were so grounded, no matter what action they would do with their legs and feet or arms and head, they never do one movement that is awkward or out of place. And when you watch this dance for some time, you can see how complex it could be. So dynamic even though it is done with short bursts. That centeredness is what I was trying to do with my surfing. That sense that everything I did was all in one action. One flowing motion and not a series of dislocated maneuvers. That took me some time to develop. I had spent some time working on that. And when I felt I got to that place – that is when surfing felt the best. And really surfing is about a feeling not a look. It’s all about this feeling and how this feels, that you are after. A sense of flowing and rhythm in relationship to the wave. And really surfing is about a feeling not a look. It’s all about this feeling and how this feels, that you are after. A sense of flowing and rhythm in relationship to the wave. Yeah, we’ve both had very similar lives – taking similar interests like Yoga, etc. We both passed through the pioneering era of surfing. We’ve all made our mistakes at many levels and come through it by holding true to our discipline and wound up in a situation like being ambassadors to a company like Patagonia which holds our values. Gerry is a fantastic person to do something like this with. He has such a great calmness, it helps me be calm. And when we did his book launching Surf is Where You Find It, with 3 different launchings in 3 different states, it was a really wonderful experience to be with him just to talk about surfing. I’ve got an enormous respect for Gerry’s surfing – which is obvious. I wanted to say something about him at the Santa Monica Uncharted Waters event but the moment didn’t present itself. But Gerry had driven down from Oregon for 12 hours just to present that show with me. Afterwards, I wish I had acknowledged that publicly. Are you pleased with the outcome of the film and the tour? How has it been for you? You talked about when it comes to surfboard design, simple is better. Can you explain? It’s just the way I’ve always preferred a surfboard. In the past, I’ve experimented with complicated bottom shapes and different components that you might label complex, but I’ve always come back to simplicity. If I have a concave or double concave, I prefer a very subtle shape – not a deep concave or deep vee. The rail shapes should blend into the bottom really smoothly and evenly. And the plan shape should be a real even curve, and along the rocker shape, the same. All of those components need to blend in my opinion. This is just my approach. I’m not saying that this is the “right” approach, I’m saying this is the one approach I have settled on. I find what this gives me is a board that performs over a broad range of conditions and wave sizes. And more importantly, if it is a really late take-off, while I’m in the barrel and the board begins to go sideways, or things start to breakdown in forward momentum and the board starts sliding – if I am really centered and relaxed, I know the board will recover on its own. I just have to go with it and do the right things with my pressure and my body and it will come out and correct itself. I just found that to be true – over and over again. It almost seems like your surfboard shaping is a metaphor for your life – everything blends well and is simple. Yeah, it is. And the way I surf, I mean I am 62 years old so I’m not trying to do what the younger guys are doing or anything like that. Again, it all comes back to where I am at in my life for my surfing. It works well for me to be following that direction. I don’t think I feel pride over myself over anything. If I feel anything, it’s more a state of gratitude for the life I’ve lived and the friends I’ve got and the family I have. I’m a very lucky man and I’ve led a very fortunate life both in where I live and how I live and the places I’ve traveled and the people I’ve met. It’s pretty unique. There are a lot of people in this world that have a very hard life – it doesn’t take much effort to see that sort of thing around you. And tragedy has touched my life too and we’ve survived it. And for that I am very grateful. Describe a perfect day for Wayne Lynch. I surf and do Qi Gong everyday for a couple of hours. I used to do Yoga for 18 years or more. And through that, I’ve learnt to take everyday as it comes and try to really respond to the situation that arises and not force myself onto anything or go against the grain of what’s taking place. As time has gone by and I have grown older, I have developed a genuine contentment with my life. Actually, I don’t know if there is such a thing. I don’t have a concept for what is “perfect.” Most of my days are satisfying – including if I’m working shaping surfboards. As I said, I live a wonderful life. I live in the Bush in a really beautiful place right on the ocean. My workshop is only 50 paces away from my house. My son lives on the same property now in another house and my daughter at the moment is living with us. So I live a serene life in a beautiful location. It will sound really corny, but I don’t really wish for anything. I’m content. Vintage photos of Wayne Lynch courtesy of John Witzig, contemporary photographs courtesy of Patagonia. Special thanks to Wayne Lynch and Emily Chan of Fresh and Clean.